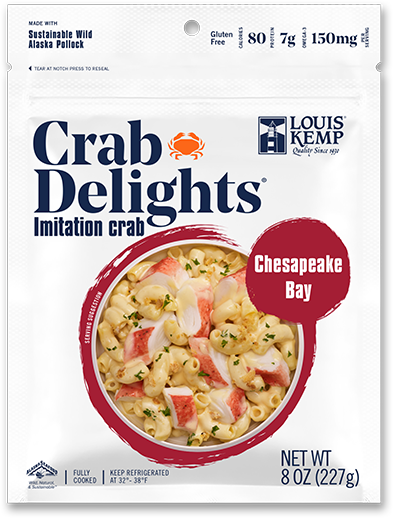 We blended traditional Chesapeake Bay seasonings into our famous flake-style surimi seafood for a winning combination of flavor and convenience. The seasoning adds that classic Maryland crab flavor to appetizers and entrees or to any other recipe that needs a boost of flavor. Available in 8-ounce packages. 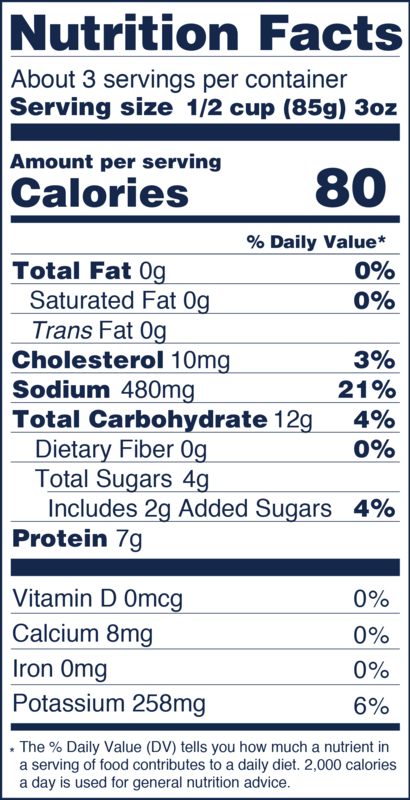 INGREDIENTS: Alaska Pollock, water, potato starch, sugar, contains 2% or less of: snow crab meat, mirin wine (sake, sugar, salt, water, yeast extract) natural and artificial crab flavoring (snow crab extract, swimming crab extract, maltodextrin, disodium isonate, disodium guanylate), salt, potassium chloride, sorbitol, pollock oil, color added, sodium tripolyphosphate, tetrasodium pyrophosphate, paprika oleoresin, lycopene (color), parsley.